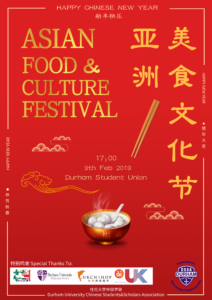 Durham University Chinese Student and Scholar Association (DUCSSA) are honoured to have been invited to participate in the city’s 2019 Chinese New Year celebrations. We are involved in the Durham City Chinese New Year Celebrations from 11am – 4pm this Saturday 9 February. Chinese Lunar New Year, also known as Spring Festival, is a traditional Chinese festival to celebrate the start of the New Year. This is one of the most important festivals in China – the time for family reunion. 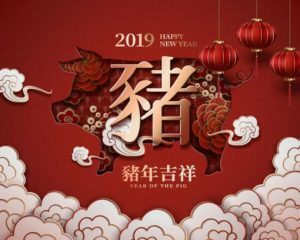 There is a long history to Chinese New Year, as ancient Chinese people created their own method of timing and calculating dates – the Lunar Calendar. There are twelve animals to represnt the zodiac and each one has a special meaning. The Chinese Zodiac also called Shēngxiào in Mandarin is a classification scheme that assigns an animal each year in a repeating 12-year cycle. The zodiac traditionally begins with the sign of the Rat as shown in above Figure. 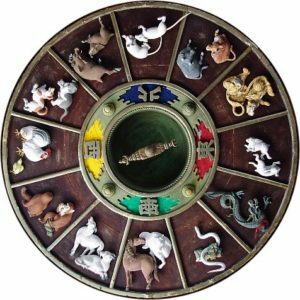 The following are the twelve zodiac signs in order: Rat, Ox, Tiger, Rabbit, Dragon, Snake, Horse, Monkey, Rooster, Dog and Pig. This year is the Year of Pig. 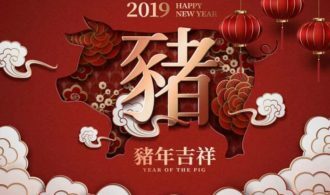 Pigs symbolize gentleness and wealth, the first day of the Lunar New Year is Tuesday, 5th February in 2019. Celebrations usually start on New Year’s Eve in the traditional Chinese Calendar. A reunion dinner is held, this meal is comparable to Christmas dinner in other countries. Dishes vary from each family, but dumplings or New Year cakes are essential for this festival. In northern China, it is customary to make dumplings after dinner to eat around midnight. Dumplings resembles a Chinese sycee shape and symbolise wealth. In contrast, it is customary to make a glutinous New Year cake (Niángāo) in the south. People send pieces of it as gifts to relatives and friends in the coming days. After being in UK for four years, I have learned that different cultures have different charms. While I am here learning about Western culture, I would like to share Chinese culture with you. This year, I have been lucky to be involved in organising the Chinese New Year celebrations in Durham city centre. This is the first time I have participated in organising Chinese Lunar New Year celebrations. 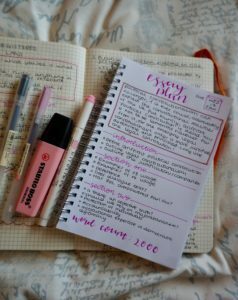 I am mainly responsible for the preparation of the programmes and the chopsticks activity, as well as editing music for the performances. I will also be modelling in the Chinese traditional costume show, which will showcase Chinese costume culture. 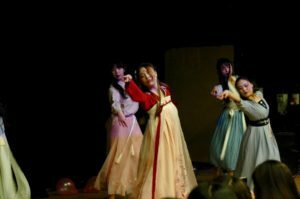 There will be six performances in Durham Town Hall, on Saturday 9 February including Chinese ethnic folk dance, a live band with Peking Opera and rap! It took a long time for me to choose the background music to be played at the Town Hall for the cultural festival, because it must have Chinese elements, a festive atmosphere and be appreciated by both Chinese and British people. I hope that people watching the various performances and experiencing Chinese traditional entertainment and folk culture, will have a deeper understanding of Chinese culture. 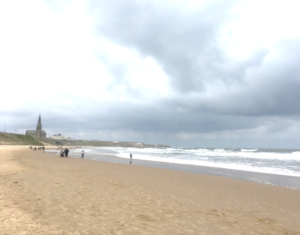 Last December, I had the great pleasure to spend a joyful Christmas in Durham. It gave me a deep understanding of British culture and the traditions of celebrating Christmas. Now I wish to celebrate Chinese New Year with you, in Durham, to share Chinese traditions. Our performances and temple fair are valuable opportunities to discover and enjoy the Chinese culture. People from all backgrounds are warmly welcomed to join in the fun! We believe the celebration will bring prosperity and good fortune to everyone in Durham and we hope to see that the culture exchanges between the UK and China will make a significant impact in building a more diverse community. Happy Chinese New Year! I wish you all the best in this year! Tuesday, 19 February 2019 , 6pm – 8pm. The museum stays open late especially for the Lantern Festival. For one night only see the Museum lit only by lanterns. Try fantastic crafts, sample delicious New Year food and drink, listen to stories and enjoy a gallery hunt. First 100 children receive a free lantern! My name is Siyan Guo, I am studying Finance at Durham University and a member of John Snow College. 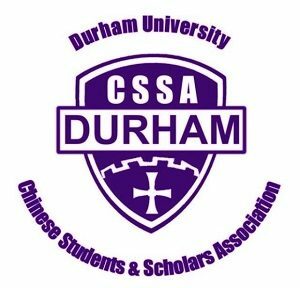 I am also the Director of the Student life subcommittee of Durham University Chinese Student and Scholars Association (DUCSSA).